Water channels. We have particular interest and expertise in discovering novel water channel proteins (aquaporins. AQPs) and measuring single molecule transport rates. Proteins currently being investigated include the mammalian eye lens aquaporin, AQP0 and the bacterial aquaporin, AqpZ from E. coli and Rhodobacter sphaeroides. Our studies have shown that the Rhodobacter spheroids AqpZ has the highest reported water transport rate of any aquaporin. We are currently evaluating whether this is due to its intrinsically high permeability or its better insertion into the lipid and block copolymer systems we use. ​Rhodopsins. Rhodopsins are unique membrane proteins that pump ions when exposed to light. While these proteins have been researched for decades a simple light driven transport assay does not exist. We are developing assays for measuring accurate per molecule transport rates for rhodopsins under various illumination conditions (see Figure). We are currently working on the chloride pump from Natromonas pharaonis isolated from highly saline lakes and the only sodium and lithium pump known – KR2 from the marine flavobacterium Krokinobacter eikastus. A surprising and totally science fiction type application of these pumps is in the field of optogenetics where parts of mammalian brains can be excited or “turned off”! In these applications these proteins are first expressed in neurons of mammals and then the neurons can either be hyperpolarized or silenced by creating or abolishing ionic gradients across membranes by the use of light. 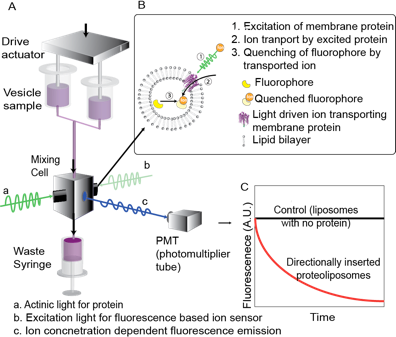 Most membrane proteins are delicate and difficult to use in engineering applications. However, their functions are quite attractive and merit efforts to develop synthetic analogs that can be integrated into engineering materials such as polymers. We are currently working with two analogs of water channels that show promise for applications in separations and barrier materials. These channels include the pillararene channels developed by our collaborators in Fudan University, China (Jun Li Hou group) and the ureido‐imadazole channel developed by the Barboiu group at CNRS, Montpellier, France. We collaborate with the Alek Aksimentiev group to conduct simulations on pillararene channels. See our publication on pillararene channels: Shen et al. 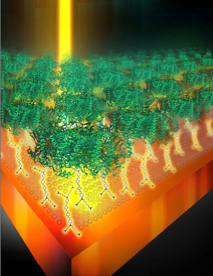 "Highly permeable artificial water channels that can self-assemble into two-dimensional arrays ." Proceedings of the National Academy of Sciences 112.32 (2015): 9810-9815. An interesting video from this publication shows that while the single file transport shown in this channel is reminiscent of aquaporins, unlike aquaporins this channel fills and empties indicating that the structure could be further optimized. Other videos from this paper can be viewed here. See our publication on probiotic biofilms here: "Wood, Thammajun L., et al. "Living biofouling-resistant membranes as a model for the beneficial use of engineered biofilms." Proceedings of the National Academy of Sciences 113.20 (2016): E2802-E2811." See our publication on microfiltration membrane fouling with Marcellus Shale wastewater here: "Xiong B, Zydney AL, Kumar M. Fouling of microfiltration membranes by flowback and produced waters from the Marcellus shale gas play. Water research. 2016 Aug 1;99:162-70." 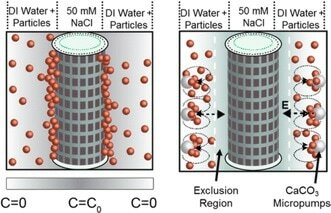 ​Also see publication on transformation of polyacrylamide during hydraulic fracturing: "Xiong B, Miller Z, Roman-White S, Tasker T, Farina B, Piechowicz B, Burgos WD, Joshi P, Zhu L, Gorski CA, Zydney AL. Chemical Degradation of Polyacrylamide during Hydraulic Fracturing. Environmental science & technology. 2017 Dec 19;52(1):327-36." conventional applications of UF, we found that concentration polarization actually promotes detergent passage thereby selectively concentrating MP-detergent micelles while allowing passage of empty detergent micelles. In collaboration with Dr. Andrew Zydney, we performed a detailed analysis of the hydrodynamic, salt and detergent conditions that improve extraction efficiency of MPs while selectively promoting detergent passage during ultrafiltration-based concentration of MPs. We have also designed a new configuration of centrifugal membrane filters that allows high detergent passage while concentrating membrane proteins (paper in review).